There are a number of well-documented cases of employers underpaying employees for hours worked. It such events, it is often difficult, and sometimes impossible for the employee to offer irrefutable evidence of the hours worked, in order to claim fair recompense. 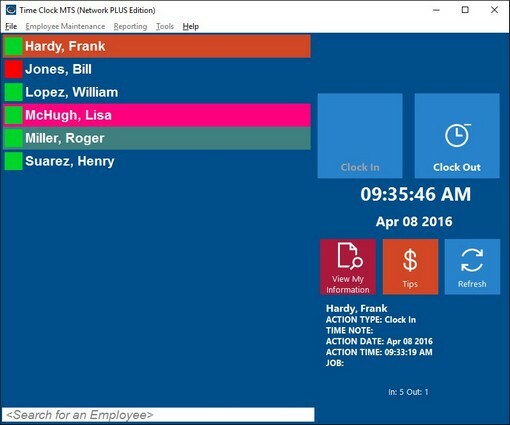 Time clock software provides informative and easily legible records of the number of hours an employee has been in attendance at a computer workstation, accurate to the nearest second. In this regard, employees can be assured that if time clock software is implemented within their place of employment, their working hours are being calculated fairly. What is more, time clock software can generate a range of reports that are suitable for forwarding to the payroll departments of their business, ensuring that the real times of work are being calculated automatically, minimizing the potential for human error. Unfortunately, there are is an equally well-documented catalogue of cases of employees dishonestly claiming for hours worked from the company for which they work. Such disputes can be time consuming and costly, and can cause irreparable damage to the moral of the employee workforce. When time clock software is in use, employees are aware that their time and attendance are being monitored and recorded, and that accurate reports can be generated with ease. As a result, time clock software serves to protect the company from disputes over payment, because the potential for false claims is eliminated. It has been known for employees to clock in and out for each other, which, of course, results in false claims for payment and inaccurate payment calculations. Time clock software removes the potential for this activity by defining a PIN number for each employee. The employee is then required to manually enter the PIN into the time clock to register attendance at work, thus eliminating the capability of other employees clocking in on behalf of absent or late employees. Company efficiency is at the heart of an effective business culture. A business that is wasting money on unnecessary administrative tasks is often not a pleasant environment in which to work. Implementation of time clock software can eradicate a range of administrative tasks that are both time-consuming and costly. Bookkeepers and business accountants spend two to five minutes per week, per employee, calculating records of working hours produced by manual time clock systems. In a business with five employees, this can amount to twenty-five minutes per week of unnecessary time spent in administrative tasks that time clock software can perform automatically. A larger business of 50 employees will, on average, spend up to four hours on such tasks. Time clock software can save substantial amounts of money, in removing the need for time to be spent on clerical and administrative tasks, whilst protecting the interests of the employee by calculating accurate records of hours, and protecting the company by prohibiting false claims of attendance.